From Bishinik, The Official Publication of the Choctaw Nation, August 1986. Of the eight Choctaws involved, one was from Bryan County, one from Choctaw County and six from McCurtain County. All were serving in the same battalion, which was practically surrounded by the Germans. And to make matters worse, it was known that the Germans had “broken” the Americans’ radio codes and had tapped the telephone lines. They were also capturing about one “messenger” out of four who served as runners between the various companies on the battle line. “Are there any of them over in headquarters company?” asked the captain. “I think that Carterby and Maytubby are over there,” Louis replied. “You fellows wait right here,” said the captain. He got onto the telephone and discovered that, indeed, Ben Carterby and Pete Maytubby were attached to Headquarters Company. The message was worded and Private First Class Mitchell Bobb used the field phone to deliver the first Choctaw code message to Choctaw Ben Carterby, who then transposed it back into English for the Battalion Commander. 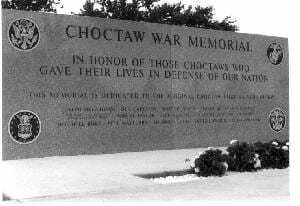 Within a matter of hours, the eight men able to speak Choctaw had been shifted until there was at least one in each field company headquarters. Now only were they handling field telephone calls, they were translating radio messages into the Choctaw and writing field orders to be carried by “runners” between the various companies. The German code experts were “flipping their wigs” trying to break the new American code. 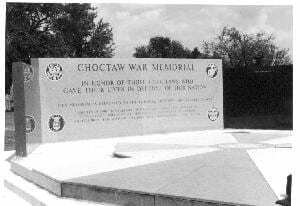 Within 24 hours after the Choctaw language was pressed into service, the tide of the battle had turned, and in less than 72 hours the Germans were retreating and the Allies were on full attack. 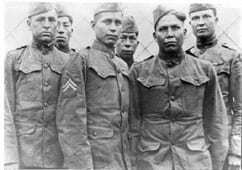 Since this occurrence was so near the end of the war, the Choctaw Code Talkers were apparently used in only this one campaign. Most of the information in this report was told to Len Green in 1979 by Solomon Louis. He said at that time he was the only Choctaw Code Talker still living.